The 350Z/370Z/G35/G37 is the next generation of the Fairlady Z, the Z33/Z34, and is Nissan's current dominating force in motorsports. With its Naturally Aspirated 3.5L Quad-Cam V6 that boasts torque from Low-Mid Range to Red-line the Z is an extremely well-adapted force in competition. In its stock configuration, it is capable of so much but is still watered-down from it s full potential due to the conservative restraints of Consumer marketing and comfort. The Z and G is a heavy-machine weighing over 3,200lbs and is plagued by body roll and a soft spring-rate for the comfort of the masses. For this reason Megan Racing has decided to develop numerous products to enhance the performance and bring out the full potential of the Z and G on both the street and track. The Z and G is sensitive and "picky" when it comes to its alignment characteristics. The Rear upper Camber is crucial to the turning capabilities and characteristics of the G and Z, these Rear-Upper A-Arms allow the adjustment of more Negative and Positive correction in the Rear and are perfect for any driver looking to properly tune their machine for performance. The Powder-coated Steel Construction also adds for durability and wear against demanding competitive conditions and rough driving surfaces as well. 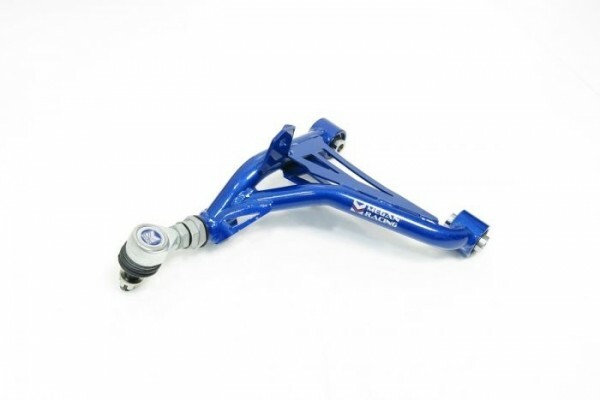 -Allows adjustment of Rear Upper Camber Arm.